Dr. Ian Winship is an Associate Professor and a former Alberta Innovates Health Solutions Scholar in the Department of Psychiatry at the University of Alberta. He is also Director of the Neurochemical Research Unit there. Ian received his bachelor’s and doctoral degrees in Psychology from the University of Alberta. Afterwards, he conducted postdoctoral research at the University of British Columbia before returning to the University of Alberta to join the faculty. In this interview Ian shares more about his life and science. Much of Ian’s free time is spent on or near the ice rink. He coaches his son’s hockey team and his daughter’s ringette team, as well as playing on his own recreational hockey team. In the summer, Ian enjoys being outside, traveling, visiting the mountains, and relaxing at the beach. While Ian’s job includes teaching students neuroscience and psychiatry, most of his time at work is spent on research. Ian is interested in understanding how we can reduce the damage early after a stroke and ways we can improve recovery in people who had a stroke a long time ago. His research also examines changes in the brain that lead to symptoms in other brain disorders like schizophrenia. As a high school student, Ian started getting interested in biology through his courses. At the time, he didn’t have a plan for his future career, and he didn’t know he wanted to become a scientist. In college, Ian started off majoring in general sciences. He attempted an honors physiology program, but it didn’t go well, and he left after one year. However, Ian was fascinated by the brain and behavior after learning about this area in his science psychology courses. Ian applied to work in his professor’s lab to get research experience. After reviewing Ian’s transcript, his prospective mentor was hesitant to allow Ian into the lab. Fortunately, Ian managed to convince his professor to give him a chance. The lab was doing research that involved tracing projections from different neurons using microscopy and electrophysiology. Ian was hooked. He loved studying these neurons and their projections. It takes a lot of time and perseverance to get to the point where you are effectively and efficiently collecting the data you need for a project. When Ian began his postdoc, working with two-photon microscopy, mice, and calcium indicators were all completely new to him. A lot of different things went wrong in conducting his experiments and collecting the data, but the difficulties didn’t end there. Once he made it through these challenges, Ian was left with a huge amount of data that he didn’t really know how to analyze. At the same time, Ian was struggling to balance his research, his finances, and commuting back and forth to see his wife in a different city. The experience was really frustrating, and Ian had to constantly remind himself why he was doing this and why the work was so important. 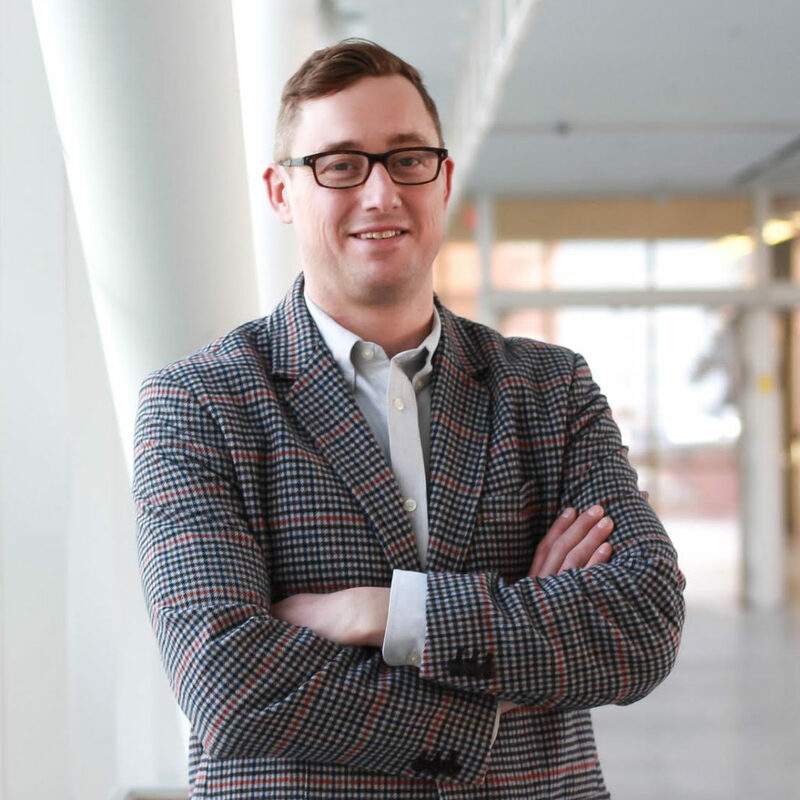 After about 10 years at the University of Alberta, Ian is at a stage in his career where he is excited to celebrate the successes of his trainees. Most recently, one of their papers was just published in an excellent journal. The paper included work from a former PhD student who had spent years doing a behavioral study on rehabilitation in a stroke model in rats. This student persisted in the research even though it was difficult, and she had severe allergies to rats. This study was also the first in Ian’s lab on which they sought media coverage. Though the interviews for magazines, online articles, and TV were daunting, it was rewarding to see how thrilled his student was about these opportunities and the feedback she got from friends and family. One of Ian’s favorite destinations he visited for science was Munich, Germany. Ian traveled there to attend a conference and present his work, but he didn’t really know any of the other conference attendees. It was a great opportunity to meet new people and do some sightseeing while he was there. Ian enjoyed touring palaces, visiting the opera house, and seeing some historical sites. The age of the city, its history, and what it had been through were remarkable. Scientists often spend a lot of time together in close quarters, so you form bonds and memories that can last a lifetime. Some of Ian’s favorite moments with his colleagues involve sitting around and talking about science. For their recently funded schizophrenia project, Ian met with two of his colleagues at a pizza place during a conference trip to discuss the possibility of submitting this grant. Looking back, it was a hilarious conversation. They started off thinking their ideas were the best and the grant was sure to be funded. After talking through it more, they decided that it was actually a horrible idea, they didn’t have any of the data they needed, and the grant wouldn’t stand a chance. By the end of their meeting, they decided it just might work, and they were going to give it a try. In science, you need to publish in order to show productivity and move on to the next step. In life, keep in mind that people will remember how you treat them more than they will remember your big paper, promotion, or other achievements. Science is amazing, but don’t let your career in science remove you from the rest of your life. You have to work hard and be passionate about what you do, but don’t forget there is a whole world outside the lab. Ian’s multi-disciplinary research investigates fundamental pathophysiology that leads to brain damage and dysfunction, and looks to use these insights to develop experimental therapies for brain disorders including stroke. Current projects seek to better understand the failure of the “collateral circulation” during acute stroke that leads to poor outcome and to develop new approaches to improve collateral flow (“collateral therapuetics”). Additionally, because most stroke survivors are left with permanent disability, his lab is exploring methods to restart recovery during chronic stroke by facilitating rewiring of the brain and spinal cord. Outside of stroke, a new direction in the lab investigates the role of perineuronal nets in the cognitive dysfunction associated with schizophrenia, with an interest in using advanced imaging to better understand the functional consequences of these perineuronal net changes. Outside the lab, Ian spends the majority of his time attempting to regain feeling in his toes after spending hours on-ice with his childrens’ hockey and ringette teams.